In July, five state teachers of the year traveled to Germany with EF Educational Tours to explore the country’s education system. 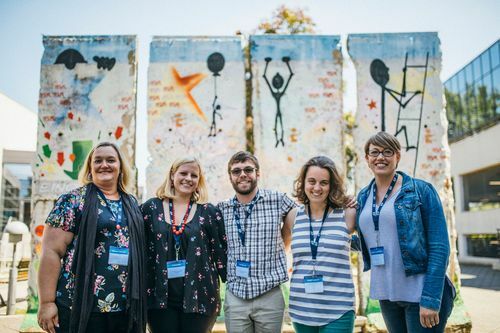 Becky Mitchell (2018 ID TOY), Leah Juelke (2018 ND TOY), Paul Howard (2018 DC TOY), Heidi Crumrine (2018 NH TOY) and Michelle Cottrell-Williams (2018 VA TOY) embarked on a life-changing cultural exploration to broaden their global perspective on education. In an interview with Education Week, these educators shared stories from their trip and what they learned about vocational training in Germany, the challenges of German teachers, student-centered learning in German schools, and how Germany confronts its past. You can read more about some of their reflections below or in this Education Week’s Teaching Now blog. According to Education Week, Heidi Crumrine was inspired by the value on student choice and voice. "When kids are invested in what they're doing, and when they have ownership, they're much more successful—and happy," she said. “Their large-scale, public program is more comprehensive than any career and technical education options in the U.S., said Paul Howard, a social studies teacher at LaSalle-Backus Education Campus in Washington, D.C.
"Even at the college level in the U.S., we haven't figured out how to give people applicable knowledge," he said. Howard was skeptical that the U.S. as a whole—a much larger, more decentralized education system than in Germany, with a more diverse student population—could effectively replicate the national vocational training model. A special education teacher who works with hearing-impaired students spoke with the visiting U.S. teachers about the ongoing challenges in including special education students in general education classes. In the U.S., federal law requires students with disabilities to be in the "least restrictive environment" possible. Almost two-thirds of U.S. special education students spend the majority of their day in general education classes, compared to about 38 percent in Germany. Germany has been including more special education students in general education classes in recent years, but some teachers have said that they lack the classroom supports to teach learners of varied abilities.